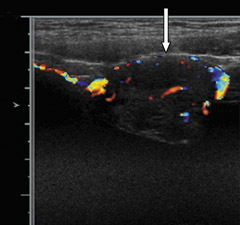 The renal ultrasound (Figure 1) revealed a vascular solid mass in the anterior wall of the urinary bladder, slightly to the left of the midline, measuring 3.4 cm transverse by 2.8 cm anteroposterior by 3.9 cm craniocaudal. 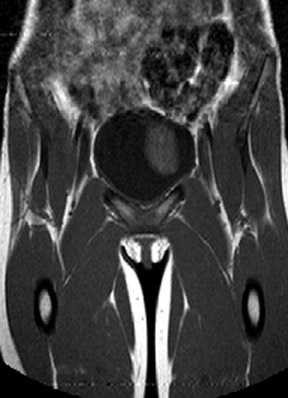 The abdomen and pelvis were otherwise normal(Figure 2). 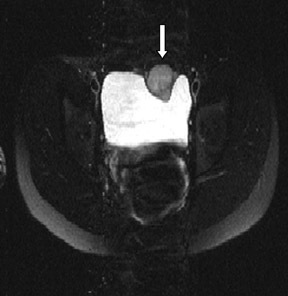 MRI (Figure 3) showed an abnormal soft tissue mass, measuring 3.4 x 2.8 x 3.9 cm, located anterior to the urinary bladder,just to the left of the midline, which indented the urinary bladder. 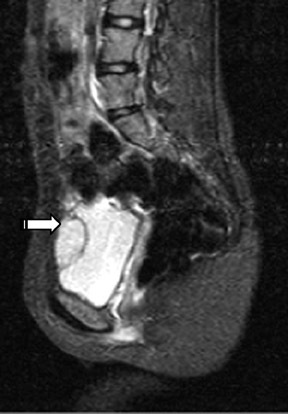 Based on the imaging findings, the patient was started on an alpha-blocker and surgery was performed after alpha blockage was obtained. A partial cystectomy was performed and the histologic diagnosis was extra-adrenal paraganglioma (pheochromocytoma). 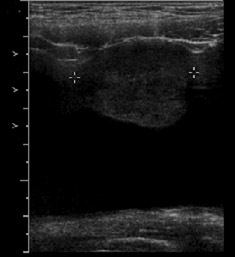 Pheochromocytomas of the urinary bladder probably arise in the paraganglia of the visceral (autonomic) nervous system, located submucosally either in the dome or in the posterior wall, close to the trigone. These lesions can be seen in the context of familial syndromes or diseases, including neurofibromatosis, von Hippel-Lindau, Sturge-Weber, tuberous sclerosis and multiple endocrine neoplasia type II. Lifelong yearly follow-up with monitoring of blood pressure and signs and symptoms, as well as catecholamine assays, is recommended. Clinicians can use 131I-methyliodobenzylguanidine (MIBG) imaging when recurrence or incomplete resection is suspected. Imaging with 131I-MIBG is regarded to be 67% to 70% specific. Imaging with 18F-fluorodeoxyglucose (FDG) is regarded as being 80% to 90%sensitive. 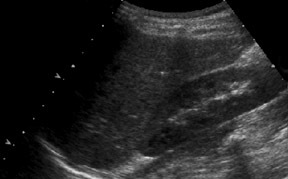 Pheochromocytoma of the urinary bladder is a rare entity that usually presents with the triad of sustained hypertension, hematuriaand postmicturition syncope. 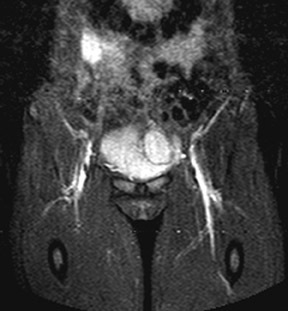 The surgical management of urinary bladder pheochromocytoma is usually partial cystectomy. Total cystectomy with lymph node dissection is reserved for malignant lesions. Whalen RK, Althausen AF, Daniels GH. Extra-adrenal pheochromocytoma. J.Urol. 1992;147:1-10. Sweetser PM, Ohl DA, Thompson NW. Pheochromocytoma of the urinary bladder. Surgery. 1991;109:677-681. Cronan JJ, Do HM, Monchik JM, Stein BS. 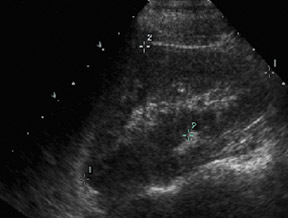 Bladder pheochromocytoma: Color Doppler sonographic correlation. J Ultrasound Med. 1992;11:493-495. Warshawsky R, Bow SN, Waldbaum RS, Cintron J.Bladder pheochromocytoma with MR correlation. J Compt Assist Tomogr. 1989;13:714-716. Kier R, McCarthy S. MR characterization of adrenal masses: Field strength and pulse sequence considerations. Radiology. 1989;171:671-674. Urinary bladder pheochromocytoma. Appl Radiol.